SmartTrade App has gone live with MasterCard and Wirecard! The long awaited day has finally come as SmartTrade has released their brand new website and improved offering containing MasterCard’s Pay by Bank App! SmartTrade App is an award winning UK payment provider, basing their technology 100% on cloud software. Since 2016, the company has had great success. They have focused their strategy on building strong and long term relationships with key industry players, which has ultimately transformed their business and financial results. In just 4 years, their total income has increased by 777%! 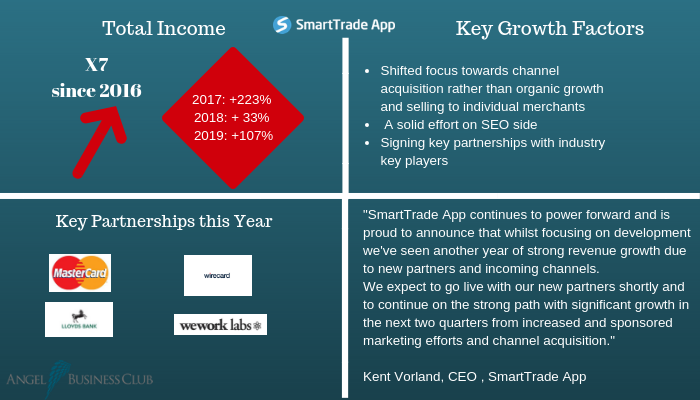 "SmartTrade App continue to power forward and are proud to announce that despite a year of full focus on development we've seen another year of strong revenue growth due to new partners and incoming channels. We expect to go live with our new partners shortly and to continue on the strong path with significant growth in the next two quarters from increased and sponsored marketing efforts and channel acquisition." SmartTrade is an outstanding business within the Prime segment. Angel Business Club is delighted for the Rockster team. The entertainment and event industry shows strong growth where new technology is one of the driving forces for increased sales. A company that benefits greatly from the development is Ridercam, which plans to list the company's shares on Nasdaq First North. The company's digital video system is installed at amusement parks around the world and more are on their way. The digitization of theme parks around the world is changing the conditions for the parks' sales considerably. Today, 30 per cent of the amusement parks' sales come from consumption in the park and 10 per cent of this comes from souvenir products in the form of still images. Noting current Ridercam is with its unique system solution and digital video technology right now in the world about delivering high resolution images and videos that are increasingly demanded. - Our assessment is that the photo souvenir market is worth about SEK 9.6 billion per year and that it is growing, says Ridercams CEO Dominic Berger. Most people who have visited an amusement park and roller coaster have probably bought a picture of the experience, an image taken by a fixed camera. But in today's increasingly digitized world, video is the case. And that is exactly what Ridercams technology delivers. The movies from the ride come directly to the mobile and then it is just to share directly on social media. - Amusement parks and visitors increasingly require video. The parks sell experiences and good memories and for that reason our system is a key to the success of the parks, says Berger and says that the company already has agreements with six theme parks around the world. Ridercam has for ten years been working on developing a product and system solution that can withstand the great stresses that a modern roller coaster generates. Until just a few years ago, it was impossible to have cameras mounted on the wagons in a roller coaster. An ordinary action camera does not cope with the stresses it is exposed to and breaks due to vibrations and G forces. Filming yourself on board is no alternative, as it is both dangerous and prohibited. The photo souvenir industry is dominated by, among others, Kodak and Magic Memories, both of whom have chosen Ridercam as a partner for digital video production at attractions in vulnerable environments. But Ridercam not only cooperates with existing photo souvenir sellers at the theme parks. The company has recently signed an agreement with Vekoma, which is the world's largest supplier of rides. This means that Ridercam can conclude agreements directly with amusement parks, and thus the margins are considerably improved. Direct agreements provide 45 percent of revenues against 20 percent in contracts with souvenir operators. The fact that Ridercam recently made the decision to prioritize direct contracts thus leads to both higher earnings and a greater flexibility in the revenue model. Among other things, direct agreements mean that the theme parks are for service and maintenance of the systems. The videos that are recorded are sold to the visitor for between SEK 50 and SEK 100, depending on the market and length of the recording. With Ridercams unique system, the films can also be supplemented with information about the attraction and contain information about other offers available in the amusement park. In addition to this, Ridercam can offer various options to get visitors to order movies of their rides. By including external advertising messages in the films, another form of revenue is created for the theme parks. - Everything that can drive advertising on social media is getting big. With external sponsorship, the interest will increase significantly, which makes the films cheaper and the profitability better, says Dominic Berger. Ridercams first commercial video system was installed in November 2017 on a new roller coaster in Warner Brothers amusement park Movie World outside Brisbane, Australia. Ridercam had forecast a sale 375 videos sold the first month, it was 2 238. The agreement in Brisbane has been concluded with Magic Memories and is a so-called second-hand contract, which meant that revenues for the first month stopped at SEK 53,000. If the agreement had instead been a so-called direct agreement, the revenues would have amounted to SEK 141,000. - The difference between the various contracts becomes tangible, and this is one of the reasons why we prioritize direct contracts in the future, says Berger. Ridercam has so far signed an agreement with six amusement parks about new installations. However, the company does not want to provide any profit forecast, but states that they will reach break-even at 15-20 installations. Positive cash flow, Ridercam, according to Dominic Berger, will be reached towards the end of 2020. Ridercam is now applying for listing on Nasdaq First North and in connection with this, carries out a new issue of SEK 23 million. The emission proceeds shall in all essentials be used to increase the installation rate. - The market for our product is well established and also growing strongly. We are currently the only ones who can deliver a functioning video system, ”says Berger. Although Ridercam currently has full focus on video systems for amusement parks, the Ridercam manager emphasizes that they are far from being a single product company. Among other things, the company's camera technology can be used, for example, to film audience experiences at football matches and other events. - We are a technology company that currently has full focus on the amusement park industry, but our technology can be used in many different environments, he concludes. Path Investments plc (TIDM: PATH) is pleased to announce that the Company has entered into a Heads of Agreement with ARC Marlborough Pty Limited (“ARC”) regarding the proposed acquisition of ARC by the Company (the "Proposed Transaction"). ARC is a privately owned, Australian incorporated company, that owns a mining tenement situated in Central Queensland, Australia. ARC has relevant government approvals to mine Nickel, Cobalt and Chrysoprase at this tenement. ARC proposes to develop its Nickel and Cobalt project (the “Project”) with the intention of producing and supplying high grade and specifically determined nickel and cobalt products for use in the rapidly expanding battery industry, such as Nickel Sulphate and Cobalt Sulphate. To achieve that outcome, the Company proposes to adopt atmospheric leaching processes such as heap leaching or vat leaching, or a combination of both, with the intention of establishing a low cost, low CAPEX operation. The Project ore is recoverable either at, or near surface, the resource having a very low strip ratio. In working towards a positive Project outcome, RF West has produced a Scoping Study in respect of the Project and which has determined the general parameters for the Project. 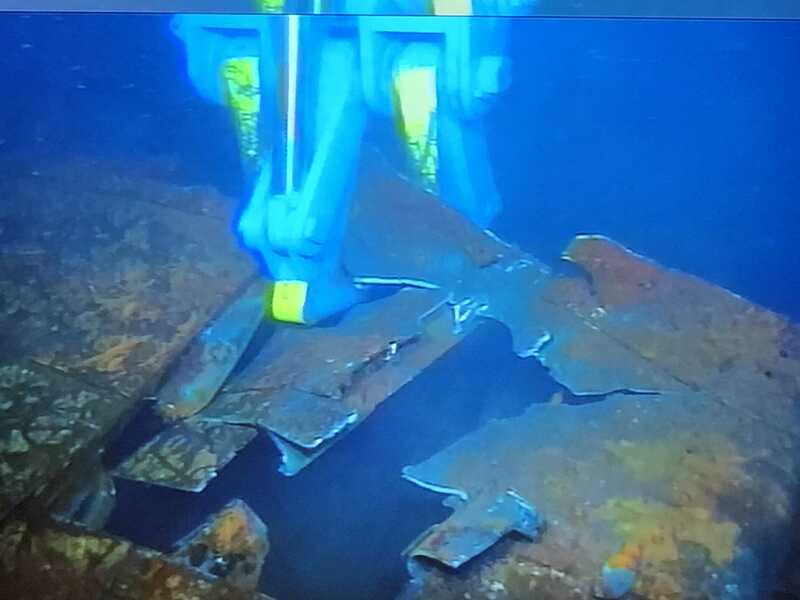 It is now proposed to complete additional confirmatory drilling, infill drilling, and drilling to depth of about 40 additional drill holes for the purpose of upgrading the resource and the resource grades. In addition, it is proposed to carry out bulk sampling and conduct metallurgical test work and leach tests. Thereafter it is proposed to proceed with a Pre-Feasibility Study, followed by a Bankable Feasibility Study on the Project. The Heads of Agreement envisages that the Company, by way of a Purchase Agreement, will acquire 100 per cent. of the equity share capital of ARC, including all the assets owned by ARC, through the issue of new ordinary shares of £0.001 each in the Company ("Ordinary Shares"). The Company has agreed an exclusivity period with ARC and expects to enter into a definitive Purchase Agreement on or before 28 February 2019.
publication by the Company of a prospectus and readmission of the Company’s Ordinary Shares to trading on the Main Market of the London Stock Exchange. If completed, the Proposed Transaction would be classified as a reverse takeover in accordance with the Listing Rules of the Financial Conduct Authority. Accordingly, the listing of the Ordinary Shares on the Standard Listed Segment of the Official List and trading in the Ordinary Shares on the Main Market of the London Stock Exchange will remain suspended. If the Proposed Transaction completes, the Company intends to seek readmission to trading on the Main Market of the London Stock Exchange. The parties intend to proceed as quickly as possible with the Proposed Transaction. However, there can be no certainty that the Proposed Transaction will be successfully completed. The Company will make further announcements in due course, as appropriate. Christopher Theis, Chief Executive of Path, commented: "We are delighted to have entered into the Heads of Terms with ARC. We believe the Proposed Transaction is one that can deliver significant value for Path shareholders and we look forward to making further announcements in due course." This announcement is inside information for the purposes of Article 7 of Regulation 596/2014.